We are NOT close to subway station yet (new subway line will open just downstair in 2019), but we are superbly connected by over 30 bus routes to the city's hustling bustling attractions, and just a stone's throw from its renowned mountain & coastal charms. All buses stop right outside The Mahjong - we are just 15-20 mins from Tsim Sha Tsui & Mong Kok, and only 25-30 mins from Causeway Bay & Central. The Mahjong neighbourhood is a foodie's paradise and still a best kept secret amongst locals. So come stay with us, and experience Hong Kong as the locals do! We have a large social lounge for you to meet people around the world. Custom built bunk beds that maximise privacy with personal light & electric sockets, keycard security locker, and privacy screen. Thick 6' hotel grade mattresses and fluffy pillows guarantee you a good night's rest. 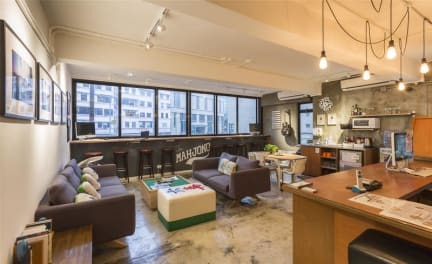 Designer touches around the hostel showcase Hong Kong heritage and culture. Friendly and knowledgable local staff are here ready to share our local experience with you. Clean, gorgeous facilities in one of the few relatively ungentrified neighbourhoods of Kowloon. 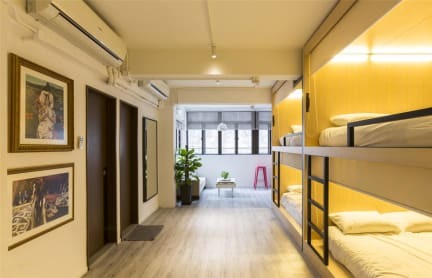 Removed from the hustle and bustle of TST or Hong Kong Island, while still accessible to said places with great bus services and an upcoming metro line! Decent food around (Bless Tsui Wah! ), and a supermarket just around the corner! Real friendly staff that go the extra mile! (Thanks for expediting my laundry!) Definitely will be back the next time I'm in HK! The staff was super helpful and it was only because of their help that I was able to do everything I wanted in Hong Kong in a limited time. It's admittedly a little far away from the main area but it's a nice neighborhood to be in. I had a very pleasant stay at the Mahjong. The staff were friendly and helpful, and the hostel was clean and welcoming. Yes, it does take 30-40 mins on the bus to get to Central but I think it is a great opportunity to explore a part of Hong Kong that most travellers would miss otherwise. There was heaps of delicious and cheap local restaurants around as well as interesting sights like food markets. There also seemed to be a number of solo travellers staying at the hostel which was great for me. I was looking to get off the beaten path and this hostel offered exactly that seemed like a boutique hostel. Stayed in a room with 6 queen sized beds and it was very comfy. The room had 6 queen sized beds, 2 ensuite bathrooms, and large overall sized rooms. The facility has keypad code to get in building and keycard to enter your room. Beds have a nice privacy screen. Large open community room that I didn't see many people using. Great place to stay! They had Moonzen beer for sale at the front desk. Lovely beds, lovely chilling area but I guess that’s what you expect for the money you pay. Would recommend , staff are lovely and it’s near afew restaurants and shops. The hostel has seen some wear since the photos were taken. The entryway to the building is very dirty. The common area is a bit shabby. The shower stalls were small and not well ventilated, so the dorm room was damp (my towel never dried). The bed and bedding seemed very clean, which I was pleased with. The personal light, privacy screen, and personal safe were appreciated amenities. The staff was kind and attentive. It's easily accessible by bus from the airport and popular neighborhoods. Staff was kind and clear. Location is fair, very easy to get anywhere from the hostel with a 15min bus ride. Facilities are just ok but cleanliness of bunks could be improved. Also there was no locker service just a small security box.